If you've spent much time reading T3 lately then you'll already know that the virtual reality revolution is well and truly upon us: flagship headsets from Oculus, HTC and Sony are all due out this year, while a number of smaller hardware makers are getting involved too. But what about creating VR content? 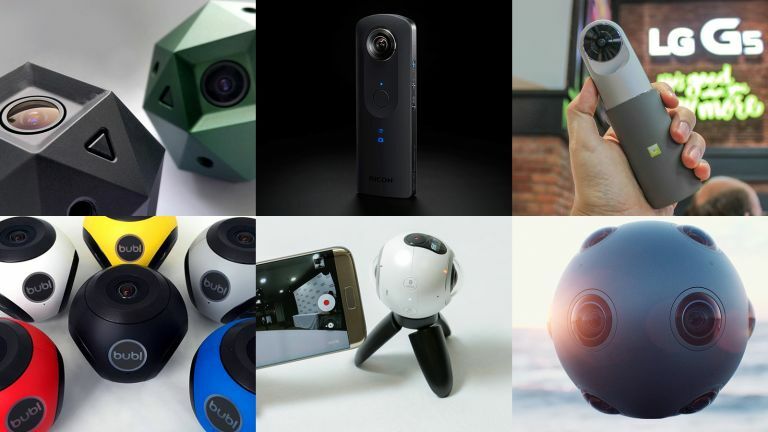 There are a growing number of 360-degree cameras on the market that let you film in all directions at once, creating movies that can be enjoyed on just about any VR device out there (including the cheapest Google Cardboard ones). Sphericam is already on its second 360-degree virtual reality camera, so you can be confident there's a certain amount of experience and expertise behind this device: you get 4K recording at 60fps, which means about 85 minutes of recording in one go if you stuff the Sphericam v2 with the maximum number of microSD cards (that's six if you're wondering). One of the friendliest-looking cameras in our round-up, the Bublcam looks like a kid's toy but packs in plenty of movie-making prowess: you can take 360-degree photos and videos, manage everything through the accompanying smartphone app, and take HDR snaps and timelapse clips too. It's light too, weighing in at 280g, so it can go pretty much anywhere. Ricoh was one of the first to dip its toes into the 360-degree movie-making waters and the Theta S is a decent choice if you want to get started as cheaply as possible. It certainly looks stylish enough though the maximum recording resolution is 1,920 x 1,080 pixels at 30fps. It is capable of live-streaming and photo-taking too (including long exposure shots). Coming very soon, the Gear 360 was unveiled by Samsung at this year's MWC as it and several other manufacturers look to add VR to their smartphone offerings. The Gear 360 can record 360-degree video at 30fps up to a resolution of 2,560 x 1,440 pixels and can do still photos and timelapse videos too. It weighs in at a mere 153g including the battery. Next up in the launched-at-MWC-2016-but-yet-to-have-a-price-or-on-sale-date is the LG 360 Cam. LG is going big on accessories this year to go with its flagship LG G5 and this is one of them - a 360-degree camera with dual 13MP lenses, 4GB of internal memory and a small and compact frame (97g) that makes the Gear 360 look a little chunky by comparison. Just for fun, here's something at the more professional end of the scale - as you'll notice if you look at the price. This is a cut above the consumer-level cameras and gives you an idea of the extra features the pros use: real-time monitoring and wireless control, live broadcast capabilities, surround sound and an integrated (but replaceable) power and memory pack.